This is without a doubt my favorite time of the year: as the weather gets warmer, it’s officially wine-drinking season! On California’s Central Coast, so many wineries begin hosting winemaker’s dinners to celebrate their newly-released vintages. The downside is these dinners are often quite expensive at $90+ per person and you’re usually forced to sit with strangers (sometimes unfriendly) who are miffed that their friends were unable to hold seats for them at their table. Hosting your own winemaker’s potluck dinner party takes both of those negative aspects away! When hosting a group of people, I shy away from opening my expensive library wines and opt to serve my favorite reasonably-priced wines that go great with social occasions. Enter Böen Pinot Noir! Made from grapes from Sonoma, Monterey (hello local gem, Santa Lucia Highlands), and Santa Barbara Counties, Joe Wagner, the fifth-generation winemaker behind Böen wines, the purest expression of his signature wine style, showcases what great wines should be like: rich, supple and succulent, at an affordable price point available at a location near you. In order to pull off an exceptional California winemaker’s-themed dinner party, rely on your guests to bring a dish that they’re proud of so you don’t have to prepare everything yourself. As a host, it’s usually easiest to prepare the main course yourself. Seasonal salad. We all have that friend who makes fabulous salads. Ask them to bring a local-inspired seasonal salad. I’ve been loving this blood orange and fennel salad lately. Plus, it’s a breeze to make! Seasonal side dish. Seasonal vegetables are always a huge success. Showstopping main course. Keeping with a somewhat rustic vegetarian theme, my cheesy vegetarian mushroom lasagna can be made in advance, and reheated while everyone is snacking on cheese, crackers, and fruits. Seasonal dessert. Vanilla panna cotta with fruit compote travels easily and is perfectly in season this time of year. For a special dessert, make this pinot noir pudding with Böen Pinot Noir. But before your guests can sit down to eat, it’s time to mingle amongst one another. Cheese boards don’t have to be overly complex or intimidating, especially if you implement the following five tips. Choose your platter surface. Shapes and sizes make a world of difference. Selecting a platter that’s too small will create unnecessary chaos and mess while one that’s too big can make the space feel empty and picked-over. Choose a board theme. To take away that overwhelming doubt about creating an eye-pleasing presentation, I find that deciding on a theme for my platters takes away the stress of trying to decide what I should include on the platter. I chose to do a California theme since the wine featured is 100% California grown. Find your centerpiece. Find something that draws your guests in. This can be a cheese, artisan cracker or some vivid, ripe fruit that’s begging to be consumed. Select your supporting items. Depending upon the number of guests, I like to select 4 or five cheeses: firm and hard (cheddar + butter crackers), semisoft (gouda + almonds), soft (brie + jam), fresh (mozzarella + soft baguette), and lastly, blue cheese (gorgonzola + fruit and honey). Add utensils and individual appetizer plates or bowls. Unless you want your guests to walk around with sticky hands, make sure to put out serving utensils, appetizer plates that hold more than a single cracker or piece of cheese, and napkins. Don’t overthink in regard to what fruits or cheeses to include. Go with what is in season, available, and most importantly, appealing to you. 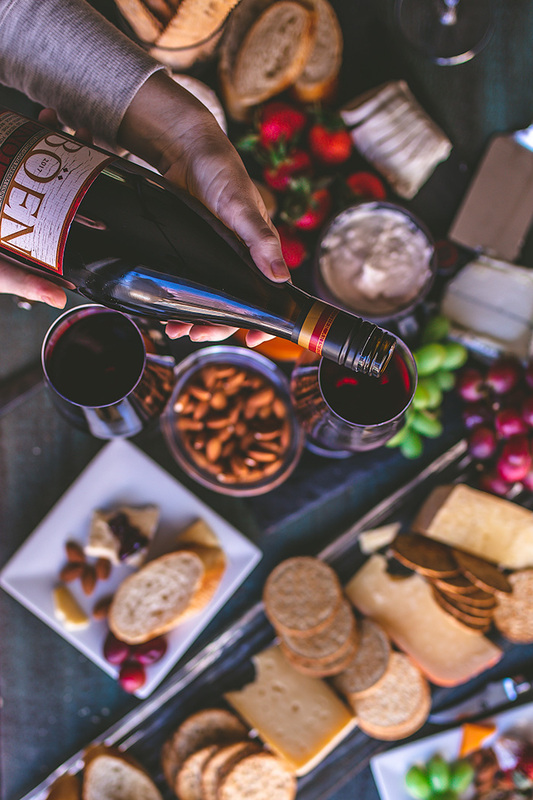 The Böen Pinot Noir is subtly fruit-forward enough to hold its own next to any variety of fruit and not overly-smoky cheese that you choose to serve. It’s also a nice wine to enjoy on its own, shared at the end of a busy workday while enjoying the lengthening days heading toward summer. 1 hour prior to guests arriving, arrange the individual cheeses around the board, giving each enough space. Fill the gaps around the cheese with the pairing item.